One of David’s most beautiful prayers is recorded in Psalm 43:3. “O send out thy light and thy truth: let them lead me; let them bring me unto thy holy hill, and to thy tabernacles.” This same earnest petition to understand God’s Word should be in the heart of every sincere seeker for truth. A willingness to learn and to obey must characterize all of those who expect to be enlightened by the Holy Spirit. To such, the beautiful promise of the beatitude will be fulfilled. “Blessed are they which do hunger and thirst after righteousness: for they shall be filled” (Matthew 5:6). But it does no good to pray for the truth if we have no intention to obey it when God answers our prayer. One of the greatest favors God can bestow upon us is to give knowledge of His Word. And the most presumptuous thing anybody can do is to pray for an understanding of God’s will and then refuse to obey, for any reason whatsoever, when the answer comes. Many people are guilty of pulling the Bible down to match their poor, weak experi­ence, instead of bringing their experience up to meet the requirements of the Word. There is only one great decisive test of truth, and that is the Bible. Every religious thought, every book we read, and every sermon we hear should be measured by the infallible rule of the inspired Scriptures. It does not matter what we were taught as children, or what the majority is following, or what our emotions lead us to think or believe. Those factors are invalid as a test of absolute truth. The ultimate question must be answered: What does the Word of God say on the subject? Some people think that if they are sincere in what they believe, God will accept them and save them. However, sincerity alone is not enough. One can be sincere, and be sincerely wrong. I remember driving to West Palm Beach, Florida, several years ago. At least I thought I was going there. It was night, and I had not seen any road signs for quite awhile. Suddenly my car lights picked up a sign that read, “Belle Glade 14 miles.” Heartsick, I realized that I was traveling in the opposite direction from West Palm Beach. I was on the wrong road. No one could have been more sincere than I was that night, but I was sincerely wrong. Now, I could have continued down the road saying that somehow, somewhere up ahead I might find West Palm Beach. Instead, I turned the car around and went back to the place where I took the wrong turn and got on the right road leading to West Palm Beach. That was the only right thing to do. God’s Word has a lot to say to those who are willing to be corrected. The people to be the most pitied are those who have closed minds. They will resist any information that varies from their personal views. Their minds are made up, and they don’t want to be bothered by the facts. This is especially true concerning the subject of the Sabbath. The Bible clearly answers these questions in the negative. Every available source of information reveals that in religious matters, at least, the majority has always been wrong. Jesus Himself said, “And as it was in the days of Noe, so shall it be also in the days of the Son of man” (Luke 17:26). Only eight people went into the ark to be saved from the flood. Christ taught that only a comparable few would be saved at the end of the world. Said He, “Enter ye in at the strait gate: for wide is the gate, and broad is the way, that leadeth to destruction, and many there be which go in thereat: Because strait is the gate, and narrow is the way, which leadeth unto life, and few there be that find it” (Matthew 7:13, 14). It is very true that the great majority of Christians today, including many famous evangelists and theologians, are keeping Sunday instead of the seventh-day Sabbath. That fact alone should not over impress anyone.Taken by itself, in the light of Christ’s words, it should raise a flag of warning. Truth has never been popular with the masses. And those in the majority today, as in all past ages, are not really looking for truth as much as they are looking for a smooth, easy, comfortable religion that will allow them to live as they want to live. Let’s begin with the first Gospel. Matthew writes, “In the end of the sabbath, as it began to dawn toward the first day of the week, came Mary Magdalene and the other Mary to see the sepulchre” (Matthew 28:1). Here we have some very interesting proof that the Sabbath could not possibly be the first day of the week. According to this recordthe Sabbath was ending when the first day was beginning. They are two successive days. Based on Scripture no one could truthfully call Sunday the Sabbath. It would be both confusing and unbiblical. The substance of Matthew’s testimony is simply that the women came at dawn on the day following the Sabbath and found that Jesus was already risen. This harmonizes perfectly with the next Gospel, which adds a few more details. Notice that Mark equates the dawn with “the rising of the sun.” He wrote, “And when the sabbath was past, Mary Magdalene, and Mary the mother of James, and Salome, had bought sweet spices, that they might come and anoint him. And very early in the morning the first day of the week, they came unto the sepulchre at the rising of the sun. And they said among themselves, Who shall roll us away the stone from the door of the sepul­chre?” (Mark 16:1–3). These parallel Gospel accounts clear up a common misconception that has arisen over the meaning of Matthew’s words “as it began to dawn toward the first day of the week.” Some have interpreted this to be just before sundown on Saturday evening. Since the Hebrew reckoning would establish the end of the Sabbath at sunset, they assume that the women came just before the first day was ushered in at sundown. Here we see the value of comparing text with text. Mark’s words make it impossible to hold the view that the women came Saturday night and found the tomb empty. He lists the very same women as coming at sunrise Sunday morning, but they were asking the question, “Who shall roll us away the stone?” Obviously, if they had been there the night before and discovered an empty tomb, they would have known that the stone was already removed from the door. Thus, we can understand clearly that Matthew’s “dawn” is referring to the early morning visit at sunrise on Sunday morning. The third New Testament reference to the first day is a simple narrative statement in Mark 16:9, “Now when Jesus was risen early the first day of the week, he appeared first to Mary Magdalene, out of whom he had cast seven devils.” Little comment is needed here, because the verse is only repeating the same story of the resurrection early on Sunday morning. The important thing to note is that nothing is said in any of these texts about the first day of the week being holy. There is no intimation of anyone observing the day in honor of the resurrection. One of the most complete word pictures of resurrection events is found in the Gospel of Luke, and here we read the fourth reference to the first day of the week. “This man (Joseph of Arimathaea) went unto Pilate, and begged the body of Jesus. And he took it down, and wrapped it in linen, and laid it in a sepulchre that was hewn in stone, wherein never man before was laid. And that day was the preparation, and the sabbath drew on” (Luke 23:52–54). Before reading further, let us carefully examine the inspired description of this crucifixion day. The vast Christian majority agrees that these events transpired on the day we now call Good Friday. Here it is called the “preparation” day, because it was a time for making special arrangements for the approaching Sabbath. In fact, the text states very simply “the sabbath drew on.” This means that it was coming up next. What else happened on that day Jesus died? “And the women also, which came with him from Galilee, followed after, and beheld the sepulchre, and how his body was laid. And they returned, and prepared spices and ointments; and rested the sabbath day according to the commandment” (Verses 55, 56). During the rest of that fateful Friday, the devoted women bought the anointing materials and made further preparation for their Sunday morning visit to the tomb. Then, as the Sabbath was ushered in at sunset, they “rested the sabbath day according to the commandment.” This identifies that holy day as the specific weekly Sabbath of the Ten Commandments and not the Passover or some other feast-sabbath that could have fallen on any day of the week. The next verse tells what the women did on the day following the Sabbath. “Now upon the first day of the week, very early in the morning, they came unto the sepulchre, bringing the spices which they had prepared, and certain others with them. And they found the stone rolled away from the sepulchre” (Luke 24:1, 2). Luke’s account of that eventful weekend proves beyond any question that the true seventh-day Sabbath can still be precisely located. He describes the sequence of events over three successive days—Friday, Saturday, and Sun­day. Jesus died on the preparation day, and the Sabbath was approaching. Christians now refer to it as Good Friday. The next day was the Sabbath “according to the commandment.” Since the commandment plainly designates that “the seventh day is the sabbath of the Lord,” that Sabbath had to be Saturday. On the day following the Sabbath, Jesus rose. Today it is referred to as Easter Sunday, but the Bible designates it “the first day of the week.” In the light of these indisputable, historical facts to which all Christianity subscribes, no one can plead ignorance of the true Sabbath. It is the day between Good Friday and Easter Sunday. Luke’s record is such a perfect chronological account of those three days that even the most simple and uneducated can locate the biblical seventh day on our modern calendar. Now we are prepared to examine the fifth New Testament statement concerning Sunday. “The first day of the week cometh Mary Magdalene early, when it was yet dark, unto the sepulchre, and seeth the stone taken away from the sepulchre” (John 20:1). There is very little new information in John’s description of the resurrection. Like all the other writers he gives no indication whatsoever that the first day of the week was ever counted holy or kept holy by anyone. So far, the significant common thread in all the Gospel stories has been a total absence of such evidence. John mentions the “first day” again in the same chapter, and this has often been misin­terpreted as a reference to Sunday worship. “Then the same day at evening, being the first day of the week, when the doors were shut where the disciples were assembled for fear of the Jews, came Jesus and stood in the midst, and saith unto them, Peace be unto you” (John 20:19). Even though this gathering behind locked doors took place on the same day as the resurrection, was it a special commemoration of that event? The circumstances make it impossible for such to be the case. The text plainly states that they were gathered there “for fear of the Jews.” The frightened disciples had already learned that the tomb was empty, and they expected shortly to be charged with stealing away the body of Jesus. They huddled together in the locked room for protection and reassurance. The fact is that they did not believe Christ had been resurrected from the dead. Mark’s account reveals that they totally rejected the testimony of Mary and the other disciples who brought word of actually seeing the resurrected Lord. “And she went and told them that had been with him, as they mourned and wept. And they, when they had heard that he was alive, and had been seen of her, believed not. After that he appeared in another form unto two of them, as they walked, and went into the country. And they went and told it unto the residue: neither believed they them. Afterward he appeared unto the eleven as they sat at meat, and upbraided them with their unbelief and hardness of heart, because they believed not them which had seen him after he was risen” (Mark 16:10–14). Thus far, we have carefully studied six of the eight New Testament references without finding a single instance of Sunday observance. In fact, every one of them reveals a consistent, total ignorance of any recognition of the first day of the week for worship, prayer, rest, or honoring the resurrection. The Gospels were written several years after the events transpired, giving many opportunities to the Holy Spirit to inspire the authors with the full facts. Jesus told His disciples that the work of that Spirit was to “guide you into all truth” (John 16:13). If first-day observance had been any part of truth, then the Holy Spirit would have been divinely obligated to reveal it to Matthew, Mark, Luke, and John. So said our Lord. Please carefully notice what the apostle said, and what he did not say. Many have assumed that a religious meeting was held and a collection plate passed. This is not the case. Paul was writing special appeals to the churches in Asia Minor, because many of the Christians in Jerusalem were suffering greatly for lack of food and daily necessities. Paul asked the church at Corinth to gather food, clothing, etc., and store it up at home until he could send men to transport it to Jerusalem. The expression “lay by him in store” in the original Greek gives the clear connotation of putting aside at home. Even Sunday advocates agree to this. First, the letter would have been shared with the church on the Sabbath when they were all gathered for worship. The first opportunity to do the work would be the next day—the first day of the week. Keep in mind that there was an apparent food shortage in Jerusalem, and the need was not primarily for money. Such famine conditions were not unusual in areas of the Middle East, as Luke reminds us in Acts 11:28–30. The church in Rome gives a clue as to the special needs of those suffering Christians. “But now I go unto Jerusalem to minister unto the saints. For it hath pleased them of Macedonia and Achaia to make a certain contribution for the poor saints which are at Jerusalem. It hath pleased them verily; and their debtors they are. For if the Gentiles have been made partakers of their spiritual things, their duty is also to minister unto them in carnal things. When therefore I have performed this, and have sealed to them this fruit, I will come by you into Spain” (Romans 15:25–28). This throws light on Paul’s counsel to the Corinthian Christians to do their work on the first day of the week, “so that there be no gatherings when I come.” Such work as gathering and storing up produce from garden and field would certainly not be appropriate on Sabbath. In these verses, Sunday is identified once again as a day for secular activities and gives no indication of religious observance. This brings us to the final reference that could provide any support for Sunday sacredness. In Luke’s history of the early church, he describes the dramatic farewell meeting, which Paul had with the believers in Troas. Those who grasp for any tiny excuse to justify their disobedience of God’s commandments have grievously distorted this account in the book of Acts. Because it is the only record in the New Testament of a religious meeting being held on the first day of the week, we should examine it with special care and interest. The full context reveals that it was a night meeting. “And we sailed away from Philippi after the days of unleavened bread, and came unto them to Troas in five days; where we abode seven days. In addition, upon the first day of the week, when the disciples came together to break bread, Paul preached unto them, ready to depart on the morrow; and continued his speech until midnight. And there were many lights in the upper chamber, where they were gathered together. And there sat in a window a certain young man named Eutychus, being fallen into a deep sleep: … and fell down from the third loft, and was taken up dead. And Paul went down, and fell on him, and embracing him said, Trouble not yourselves; for his life is in him. When he therefore was come up again, and had broken bread, and eaten, and talked a long while, even till break of day, so he departed. And they brought the young man alive, and were not a little comforted. And we went before to ship, and sailed unto Assos, there intending to take in Paul: for so had he appointed, minding himself to go afoot” (Acts 20:6–13). It is obvious that this farewell meeting was held on the dark part of the first day of the week. There were lights in the room, and Paul preached until midnight. It is important to understand the Jewish way of reckoning time. Days were not counted according to the pagan Roman method, from midnight to midnight. In the Bible, the day begins at evening. Genesis describes all the days of creation week in the same way—“The evening and the morning were the first day … the evening and the morning were the second day,” etc. In other words, the evening always comes first in the day. This explains why the Sabbath is described in these words, “It shall be unto you a sabbath of rest, ... from even unto even, shall ye celebrate your sabbath” (Leviticus 23:32). But when does the evening begin according to the Bible? “And at even, when the sun did set, they brought unto him all that were diseased, and them that were possessed with devils” (Mark 1:32). Since the Pharisees taught that it was wrong to heal on the Sabbath, the people waited until the Sabbath was over before bringing their sick to Jesus. Therefore, they brought them “at even, when the sun did set.” Moses wrote, “Thou shalt sacrifice the passover at even, at the going down of the sun” (Deuteronomy 16:6). In Nehemiah, we are given another description of the beginning of Sabbath. “And it came to pass, that when the gates of Jerusalem began to be dark before the sabbath, I commanded that the gates should be shut, and charged that they should not be opened till after the sabbath” (Nehemiah 13:19). This definitely places the first moments of the Sabbath at sunset, when it is beginning to be dark. Incidentally, Paul’s missionary companions, including Luke, who chronicled the highlights of the carefully scheduled voyage, manned this boat. It is very significant that they would not go out to sea until the Sabbath was over on Saturday night. Toiling at the oars and sails would have been no more proper for a holy day than Paul’s twenty-mile walk across the isthmus on Sunday morning. Neither Paul nor his fellow travelers would have indulged in those secular activities on God’s holy Sabbath. Some have equated the breaking of bread with the communion service, but such a view cannot be supported from the Scriptures. Luke assures us that those early Christians broke bread daily. “And they, continuing daily with one accord in the temple, and breaking bread from house to house, did eat their meat with gladness and singleness of heart” (Acts 2:46). The Bible cannot confirm the contention that Paul celebrated the Lord’s Supper with the believers in the upper room. The wording seems to indicate that it was a common meal they shared together. “When he therefore was come up again, and had broken bread, and eaten…” (Acts 20:11). Here we find that eating was associated with the breaking of bread. It is unlikely that the communion meal would be referred to in this manner. But even if that farewell meeting had included the celebration of Christ’s suffering and death, it would not lend any credence to Sunday observance. We have seen from Acts 2 that bread was broken daily, and nowhere is the Lord’s Supper linked to any particular day. It is surely obvious to anyone that the Troas meeting was not a regular weekly worship service. The importance of that all-night session appears in the miraculous raising of the young man Eutychus, and in the fact that Paul would never see them again before his death. The particular time frame—all Saturday night—has no spiritual significance whatsoever. Luke, the careful historian, does not even record any of the content of Paul’s marathon sermon, although he faithfully documents the miracle of the resurrected youth. Apparently, it was the way Eutychus dropped out of church, and not the day on which it happened that Luke is seeking to establish. We have now completed an intensive examination of each one of the eight New Tes­tament references to the first day of the week. Not one of them has offered the slightest evidence that Sunday was ever sanctified by God or celebrated by man. God’s great infallible test-Book has revealed that the majority is following tradition instead of truth. Millions have been deceived into blind adherence to an empty pagan symbol. I am reminded of the story of a Russian czar who took a walk one morning in the border area of his extensive palace grounds. There he saw a soldier with a gun on his shoulder marching up and down near a deserted corner of the courtyard wall. He asked the soldier, who was apparently on sentry duty, what he was guarding. The man replied that he was only following orders and did not know why he was assigned to that particular spot. The czar asked the captain of the guard what the soldier was doing, but he had no idea either. The general in charge of the palace security was consulted, but he could give no reason for the assignment. Finally, the king ordered a search of the dusty military records, and the mystery was unfolded. Years and years before, the queen mother had planted some rose bushes in that corner ofthe courtyard, and a soldier had been sent to protect the tender plants from being trampled. Later, someone had forgotten to cancel the order, and the daily sentry ritual had continued through the years—soldiers with their guns, guarding nothing but an empty rose plot. 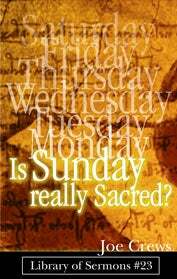 Today there are millions of sincere Christians who are religiously trying to protect the sanctity of Sunday. They don’t realize that there is really nothing to guard. The first day of the week is just as devoid of holiness as the deserted courtyard of roses. Jesus said, “Every plant, which my heavenly Father hath not planted, shall be rooted up” (Matthew 15:13). Now that we have exhausted all possible sources for Sunday keeping without finding the smallest favorable evidence, let us turn to the inspired history of that early church. If they did not keep the first day of the week, which day did they observe? The book of Acts establishes a consistent pattern of seventh-day Sabbathkeeping. On one occasion, Paul was petitioned by the Gentiles to hold an exclusive service for them on the Sabbath. “And when the Jews were gone out of the synagogue, the Gentiles besought that these words might be preached to them the next sabbath … And the next sabbath day came almost the whole city together to hear the word of God” (Acts 13:42, 44). How interesting it is that their Sabbath worship is spoken of in the context of continuing in God’s grace! Modern critics of the Sabbath try to label Sabbathkeepers as legalists who are aliens to the grace of the gospel. Not so the writers of the Bible, who constantly associate obedience with true salvation by faith. Even with no church to attend, the apostle sought out a spot where religious worship was carried on—a place of prayer by the river—and preached to those who went there. Surely, no one can fail to discern Paul’s deep commitment to the Sabbath as we follow him in this unusual outdoor mission. Just suppose this Macedonian experience had taken place on the first day of the week instead of the Sabbath. Without question, it would be cited as absolute evidence for Sunday worship, and we would have to concur. But what possible arguments can one present against this example of Paul in true Sabbathkeeping? Again, we read about Paul’s customary practice in these words, “And Paul, as his manner was, went in unto them, and three sabbath days reasoned with them out of the scriptures” (Acts 17:2). “And he reasoned in the synagogue every sabbath, and persuaded the Jews and the Greeks” (Acts 18:4). Finally, we cite the great apostle’s per­sonal testimony that he never kept one Sunday holy in his whole life. Just before his death, Paul made this emphatic statement to the Jewish leaders, “Men and brethren, though I have committed nothing against the people, or customs of our fathers, yet was I delivered prisoner from Jerusalem into the hands of the Romans” (Acts 28:17). But we are not looking for the most popular way or the most convenient way; we are looking for the Bible way. And we have found it. In all honesty, we must declare that the prevailing custom of keeping a different day from the one commanded in the great handwritten law of God is contrary to the Word which will finally judge us. No amount of popular, majority opinion can annul the weighty testimony of a plain “Thus saith the Lord.” We must stand upon the Bible and the Bible alone for our doctrine on this subject. The Word of God declares, “The seventh day is the sabbath of the Lord thy God: in it thou shalt not do any work” (Exodus 20:10). Until we find some indication in the Bible that God retracted that moral law which He introduced to the world with such a fanfare of power and grandeur, we will accept the Ten Commandments as still relevant and binding today. God said what He meant, and He meant what He said. Some argue that God exempts us from the fourth commandment because it is impossible to keep the seventh day in the competitive, industrialized society in which we have to earn a living. It is undoubtedly true that Satan has manipulated the economic world to the distinct disadvantage of the Sabbathkeeper, but Godhas never required the impossible. It is never necessary to break one of God’s commandments for any reason. You may say, “But my employer requires that I work on Saturday, and I can’t let my family starve.” The answer to that dilemma was given by our Lord long ago in the Sermon on the Mount. He said “But seek ye first the kingdom of God, and his righteousness; and all these things shall be added unto you” (Matthew 6:33). The preceding verse defines “these things” as food, clothes, and job. Jesus is simply telling us that if there is ever a conflict between obeying Him and obeying our employer, we should put Him first. Material considerations should never be made more important than doing God’s will. In every case, God honors the faith of a Christian who decides to keep the Sabbath regardless of what happens to his job. Many times God works miracles by making special arrangements for the Sabbathkeeper. In some cases, He allows His children to be tested by losing their jobs, and then opens up better ones in response to their faith. Nevertheless, the “things” are always added when we trust Him and obey, regardless of the circumstances. The real secret of keeping the Sabbath of the Lord is to have the Lord of the Sabbath in our hearts! It is love that leads God’s chil­dren to choose death rather than disobedience to one of His commandments. Jesus said, “If ye love me, keep my commandments” (John 14:15). The apostle John defined love in these words, “For this is the love of God, that we keep his commandments” (1 John 5:3).